- נחיתות = בקמפין הנחיתה בבסיס המיועד יהיה מאוד חשוב אחרת זמן החזרה לשימוש פעיל יהיה ארוך מהרגיל. A little information about the rules and terms of engagement in our campaign. Skip bombing is banned in our campaign so please do not attempt it, you are allowed any other kind of attack (high, diving or shallow) but not skip bombing. The axis side are also banned from such attacks. There will be at least two massed paratrooper assaults against Crete bringing a lot of Ju-52s as targets. We are only interested in destroying Ju-52s that are still carrying paratroopers, if you see a Ju-52 toggle its wingtip smoke then stop shooting at it and select a different target. Wingtip smoke triggers the drop of the paratroopers. Please pay particular attention to where you are supposed to land in the briefing because if you land at the wrong airfield your aircraft will be delayed for an extra mission before it can be used again. So take note of your fuel situation and ensure you can get back to the correct airfield. If you are damaged or dead stick just get your aircraft down at any airfield. אני מציע שנפגש היום לקראת סיום השיעור בבי"ס טיסה של IL2 (בסביבות 21:30?) ונעשה בדיקת מוכנות טכנית שיש לכל טייסי הקמפיין את המוד HSFX v6 מותקן כהלכה ומעודכן לגירסה 6.0.15. 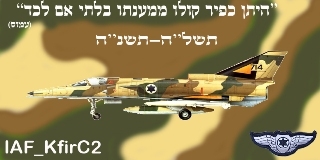 שיש לכל טייסי הקמפיין את המוד HSFX v6 מותקן כהלכה ומעודכן לגירסה 6.0.15.